Successfully Added LED Light String 'Starry Night' - 10 Meters, 100 LEDs, 40,000 Hour Service Life, 8 Modes. 10M Remote Control to your Shopping Cart. The starry night LED light string has 100 decorative LEDs to decorate your home or office. Bring a touch of magic and flare to your ornamental displays or liven up the home with these water resistant LED lights. ideal for outing around focal points to such as mirrors, plants and ornaments. Controllable from up to 10 meters away with the included remote controller you can switch between the 8 lighting modes from anywhere in the room. You can set the lights gently glow and twinkle as or dance and flash intermittently building into a crescendo of light that will bring your room to life. Powered by 3 AA batteries and having a 40,000 hour service life these decorative LED lights are a fabulous addition to parties, celebrations and festivities and will bring years of enjoyment. 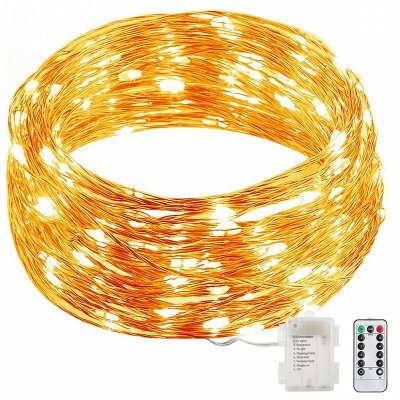 The "Starry night" LED light string comes with 12 months warranty, brought to you by the leader in electronic devices as well as wholesale LED lights..